There are thousands of people who are constantly working hard to shed those extra kilos away. Many videos, channels and articles speak extensively about weight loss. But there are few people who are willing to gain weight. 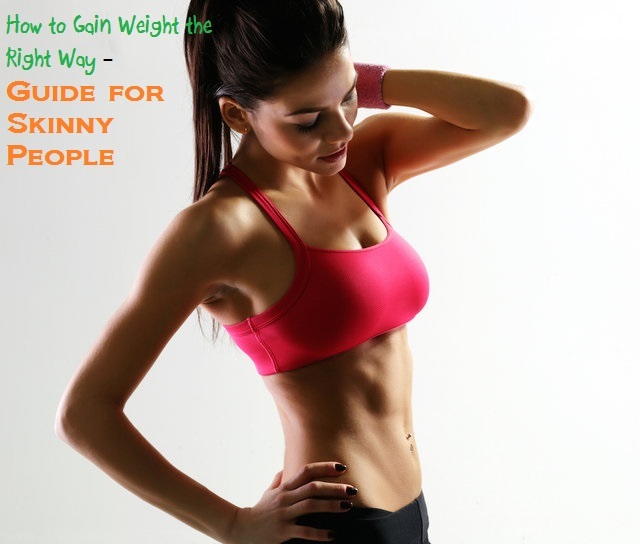 People who are skinny and too thin are finding ways to put on weight so that they can look fit and healthy. They find ways to increase their body mass and weight continuously. Being slim is what everyone dreams of. But being to skinny is not recommended these days. It is against the fashion rule and to top it all, it makes you feel weak and prone to diseases. This can be harmful to your health. Try to ponder over this issue and you will come up with answers. Firstly, is your metabolism rate the cause for all the weight loss or it’s in your genes? Do you take a proper diet or you are prone to some disease related to loss in weight? Keep all these factors in mind and plan further course of action. Gaining weight is easier than losing it. Start you workout and regime depending on how much weight you want to gain. On the basis of this you can calculate your calorie intake per day. If you are on a weight gain plan, then gaining weight continuously is the key factor. Eating good and dense food will help you to add fat in your body and revive the strength. Keep in mind, not to go for any short cut like indulging in oily and fatty food so as to gain weight in short time. Eating nonstop until you puke is not recommended even in worst cases. Try to eat food which will add up some good fat into your body. Food rich in nutrients are recommended to get the correct nutrition. Try to maintain a chart of all the healthy food advised. Try to differentiate between protein rich foods which will not have any adverse effect on your health. Secondly, try to include eatables like salmon, tune, legumes, beans, and eggs, chicken in your die so that you get a proper supply for each type of nutrition in your body. Many of the energy rich foods like juices, whole wheat bread, pasta, oats, brown rice, nuts, banana, and other such vegetables are always encouraged during weight gain program. Avoid indulging in fatty food as they will help you to gain weight in few days, and will make you feel unhealthy and lazy at the end of the day. It can also lead to severe health related problems. Food like, burgers, cheesecake, onion rings, candy bars, doughnuts etc are rich in fatty foods and its intake should be very less. When you eat a French toast, you are actually consuming a huge amount of cream which is unhealthy for your body. If you don’t have the habit of eating large portions, it will tough for you to eat more than your appetite in a day. At such times, these tips will come handy. Instead of consuming everything at a time, divide you food in portions. Try to consume 3 medium meals and 2 snacks in between each meal to maintain your appetite. Smoothies are an amazing way to increase your weight. Try mangoes and banana smoothie which are very yummy and made up of milk, yoghurt and other healthy ingredients. Sandwiches are recommending during weight gain process. Adding a slice of cheese in it will add to the taste and help you gaining weight at a fast pace. If you are not used to eating large portions, then start with your normal quantity on day one. Day by day, try to increase the quality slowly so that you will be able to adjust and adapt to it. Be selective when it comes to snacks in between the meals. Having granola bars, nuts and yoghurt is an amazing snack to try. It will help you to gain weight in a healthy way. Drinking zero-calorie drinks is not recommended. Instead adding milk to tea or coffee will add to its richness and will make you feel fuller. While making vegetables, try to add rich ingredients like cream, cheese, spreads, and sauces. Don’t stay away from oil. A moderate amount of fat is essential to maintain a good health. Be it a weight loss programme or a weight gain programme, exercising is equally important in both the cases. It will help you to stay healthy. For weight gainers, strength training is the best way to increase your appetite. It helps you to increase muscle content as well as metabolism. So eat more so that you don’t fall short of energy. Concentrate more on the muscles exercises. Use dumbbells to make them stronger and flexible. Anaerobic exercises are recommended these days for people who want to gain weight. It is used to build muscle mass and increase strength, speed and power. Also, you can try complex exercises to look healthier and lean at the same time. Another way to strengthen your body is to practice yoga. It will help you to get rid of ailments like stress, poor metabolism and lack of stamina. Yoga positions like shavasana and sarvangasana are very beneficial for weight gaining process. Pranayama is also recommended as it helps you to connect body with the soul. Moreover, it makes you calm, energetic and composed. Try to be ready for the changes your body will go through. Change your habits for the good and try to make the most out of tips said above. Eat healthy and simple so that you can get most of the benefits of this program. Don’t panic if you fail to see immediate results. Each body is different and will take its own time to adjust to the new regime and act accordingly. Choose the food smartly and exercise your way to healthy and good life filled with happiness.